Another new one for the weekend! 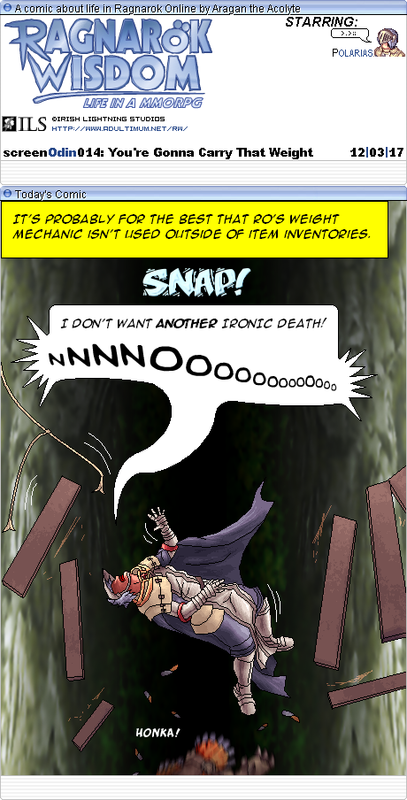 Sniff's first appearance in Ragnarok Wisdom's return and he's already sleeping on the job! I've been having a very bad time since the end of September. I was hoping that my personal life was stabilizing after what happened in 2013, but it hasn't and I've been pretty damn miserable. I haven't faced anything as seriously threatening to my life as the events that forced me to put Ragnarok Wisdom on hiatus, but I've had to deal with multiple problems popping up that have forced me to divert most of my energy and free time trying to address. It seriously impacted my attempt to participate in the recent headgear contest, and it's clamped down on my ability to put out new updates to Ragnarok Wisdom consistently. As a result I only had a few hours today to work on this comic, and there was no way I could shade it before midnight fell. I'm actually not on Re:START. Someone's taken Aragan's name on Odin and there's nothing I can do about it. You can find me on Chaos though. Seriously. This guy does alot for the community providing a humorous comic that alot of us can relate to. He deserves to have his name back. Internet outage interfered with me getting this posted before midnight, but what can ya do? Gut Funk told me about that thread while I was going through chemo! It helped me to know you guys were thinking about me back then, during a time when I was seriously wondering if I needed to write a will and plan for my own funeral. I believe there is a way of petitioning for the name of Aragan by opening a ticket. If the Aragan on Odin is inactive, then the GM will clear the name and make it available again. LOL! Much of this comic made me laugh and is very good. Thank you for sharing. Oh nice. These comics are the best. 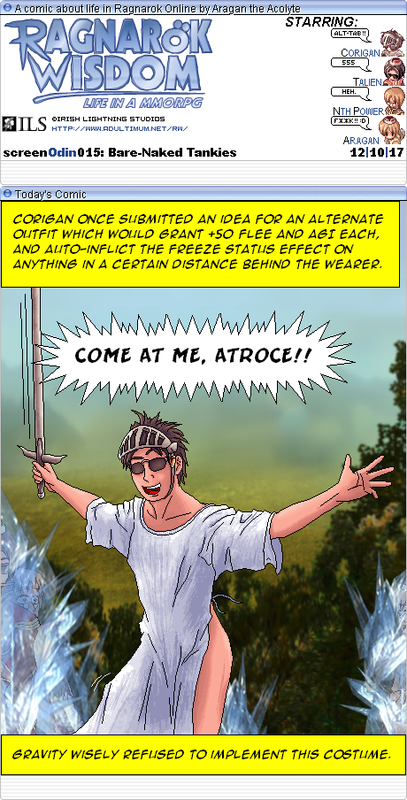 It looks like Aragan's name has been taken by a name squatter. 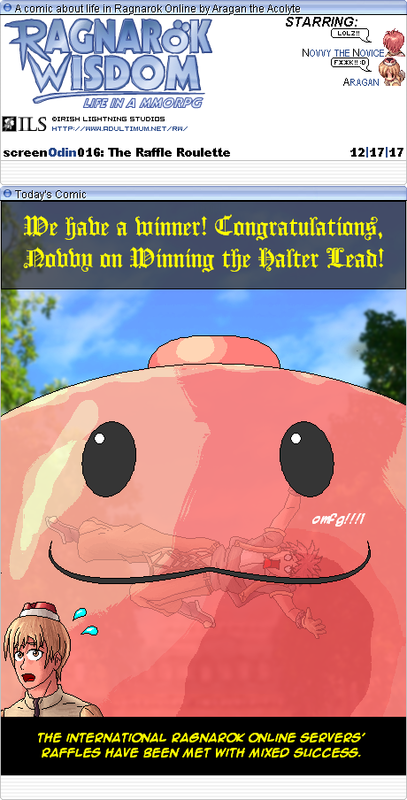 The name has been taken by a level 1 Novice. Here's a new one for the week! Poor Polarias. At least this way, getting to Nifflheim would be a lot easier. Indeed. I had contacted Warp Portal Support about it a while back, but they told me names were first come first serve. Though, over the past week Campitor reached out to me and offered to free up the name! So now I am on Re:START! Yeah, like Draobyek said, the guy who took the name left their Aragan as a level 1 novice. I first inquired about the taken name in October. 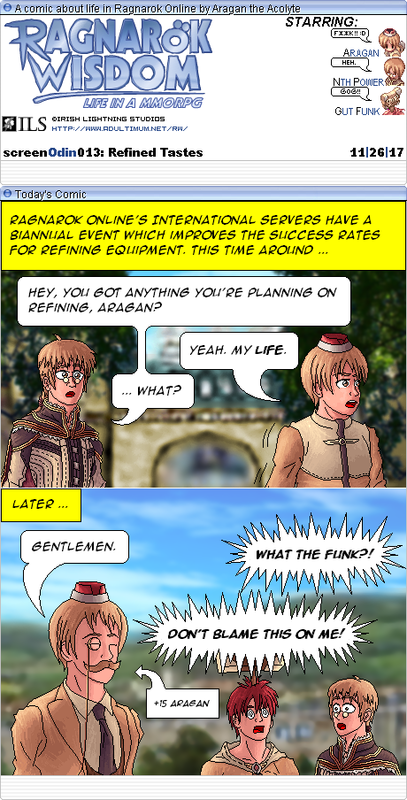 Welcome back to RO and welcome to Restart! Let me know when you make it in game. I've got some stuff for you. Got a new one for the week! I actually had a visit to the ER that took up most of my free time today. Thankfully it turned out to be a false alarm (though the doc said it was wise of me to make the visit due to my medical history) ... but it did provide inspiration for this comic. Will do! And I appreciate it! Just need to get up and out of the quagmire that my life's become. Had a few hours to get one out the door today! 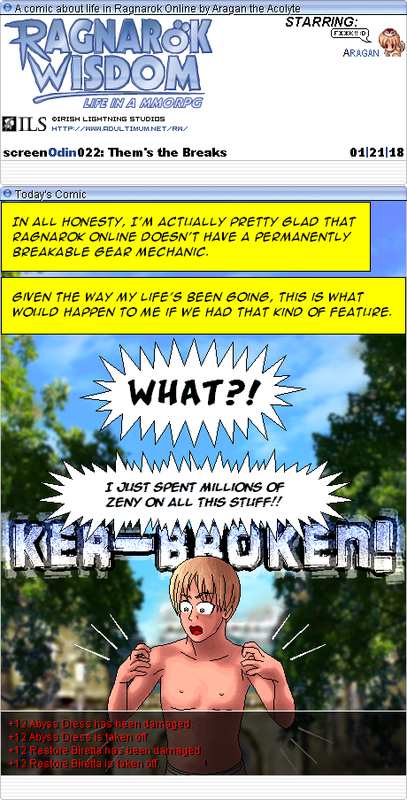 Kiniro actually inspired this week's comic, but probably not in the way he intended. Oh well, anyways, welcome back! Edited by 100000190866230, 24 December 2017 - 10:57 AM. 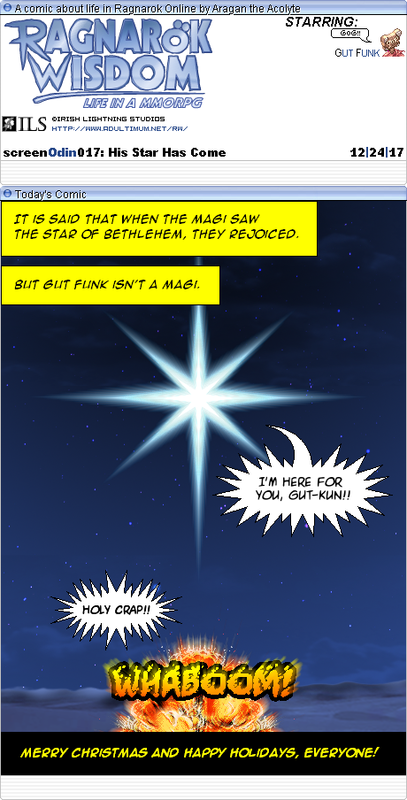 A quickie for Christmas Eve; tomorrow I plan on having a more substantial comic out! A bit of trivia here! Gut Funk's fear of Star-kun stemmed from a reaction to an old flash video, Shii's Song. His star came, and he went up in flames. So long as Novvy gets covered in goo, right? Way back in RO's betas, there was a Japanese artist who made a series of oekaki pics turning RO's monsters into monster girls. Nothing risque, though, at least nothing more risque than Isis. Had some more connection trouble keeping me from getting this out the door before midnight Pacific time, but that's out of my hands. I still got this done for Christmas Day and that's what matters! I quite like the TF (transformation) fetish, but it's not the one I'm reminding about. I'm reminding about a different fetish. I know the name, and I won't spoil you because it might ruin the surprise. Edited by 100000190866230, 26 December 2017 - 11:34 AM. Last one for the year! Ironically, given the comic, I wasn't able to finish working on this before midnight drew near, so I just uploaded what I had. R-ruin the surprise ... ?! Here's the comic for the week! Talien suggested the idea behind today's comic. Though this probably isn't what he had in mind, either. 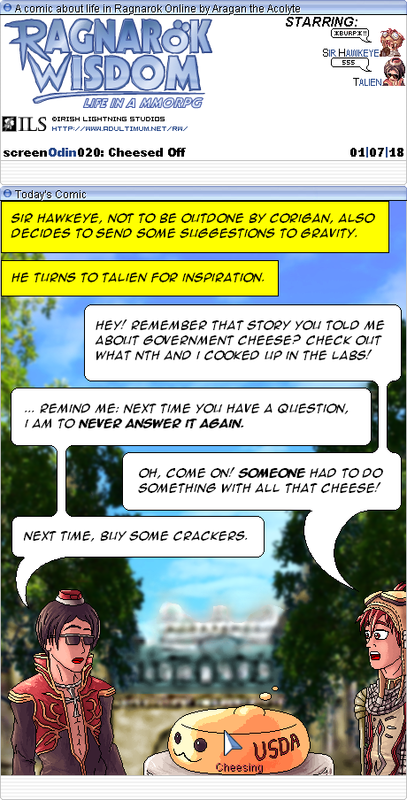 Things never go as planned when Sir Hawkeye or Nth Power are involved. Actually, does ANYTHING we do EVER go according to plan? The next cash shop item! New one for the week! Sniff the Raven came up with this one! And yeah, he does play RO: Idle Poring. And yeah, I've had this happen to me a lot just this month. Without going too into detail: my car, my phone, my tablet. All in short amount of time. Not a fun situation at any point in time, but I'm still trying to recoup what I had to spend on tuition and cancer treatment.